Lenore and Lisa Commisso launched Lisa August in 2013, using Italian acetate as the major component. The material is a vegan resin-like material typically used for high-end hair accessories and eyewear. It is lightweight, durable, flexible and will not chip, the color effects go all the way through. The Lisa August look is clean and simple, bold without weighing you down with a clunky look. Made in New York. 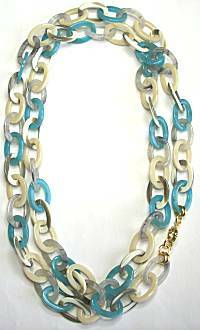 46 inches long, easy to wear long or doubled, has a goldplated large spring ring clasp if needed. Each oval ring measures 7/8 x 9/16 inch, made of strong and lightweight Italian acetate. The rings are permanently closed, colored through as marbled turquoise blue, ivory, and gray/ivory. 1-3/8 inch wide in Italian acetate, the filigree design keeps it light and decorative. Super strong and flexible for easy on-off wearing, forms about 2-1/4 x 1-3/4 oval interior space. The acetate color has tonal variations of ivory colors. 20 inches long with large goldplated spring ring clasp. In back there are 7/8 x 9/16 ovals of lightweight Italian acetate permanently closed and interlocking. The size increases to 1-3/4 x 1-1/4 inch ovals in two strands creating a bold statement, but not bulky looking as the pieces are light, strong, and flat. Colored in stripes of ivory and gray. 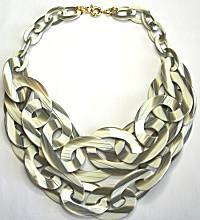 Read about what others think of Lisa August jewelry! Instead of reviews for a specific product, this is a place to share about the designer line in general.